I go to Mystic, Connecticut all the time because my parents live there. Even if your parents do not, it's a place worth going. You've got the New England charm, the New England houses, the New England shoreline on a place that is walkable, has an Amtrak stop, is close to Bluff Point State Park and, of course, the home of the Mystic Cycle Center. One of the things you have to do in Mystic – whether you bring your own bike or get one from the shop – is ride around the Mystic River. Here's a view of the famous Mystic River Drawbridge if you're at the nearby Mystic River Park. And here's a much more common view of the Mystic drawbridge; one you usually see if you're trying to move from one side of the river to the other as quickly as possible. During this season, the bridge goes up every hour during the day in a traffic-snarling spectacle that often makes tourists gawk and residents groan. If you're in a car and the bridge goes up, turn off your engine – and if you're on the right side of the bridge you can briefly abandon your car and get a Kona Coffee ice cream cone at the Mystic Drawbridge Ice Cream Shop. If you're on the non-ice cream shop side of the bridge (as I was when this photo was taken) you can relax a moment and watch the boats pass through. When you finally have the chance to go to the other side, you can head around the Mystic River by first turning right down Gravel Street. Be sure to look to the right through most of this ride since that's where the river is. Follow Gravel and take a right on Pearl Street (which gives you a nice view of the Mystic Seaport) then take another right on River Road. It's flat, it's peaceful and I have to do this ride at least once every time I'm visiting my folks. As you pass under the I-95 highway bridge, you come to this sign. One day I want to build a bike that is in the shape of the one represented in the carving. The information in the sign is accurate, as here you will find a few joggers and cyclists as you circumnavigate the river. After a short uphill that takes you past a cemetery, you'll soon come to Rt. 27, where you will take another right. It's an occasionally busy road, but motorists to tend to give you a generous amount of space. If you want another ice cream treat, look for the octopus bearing them as you get closer to town. This is also one of the several ice cream places in town that are accessible by kayak. Not far beyond the Sea View Snack Bar is the famous Mystic Seaport. I recommend you visit and become a member, as it's just a great showcase of shoreline history. The Seaport also hosts events from time to time, and thanks to my alert wife (and later, my alert mother) I knew to be in town the day I took this river ride. When I returned to my parents house, we all set off for the Seaport to attend Bicycles by the Sea. At the gate, I asked permission to bring the recumbent into the Seaport. I was allowed but was told, not surprisingly, that I couldn't ride it while inside. Still, I was glad to walk it about since I thought the bike, which is normally the oddest thing on two wheels in a ten mile radius, would fit right in. This was one of those days when I wished I had visited an ATM machine and prepared a shopping list before my arrival. There were parts everywhere. I ended up buying two old-style headlamps and two generators and reasoned I'd come up with a need for them at a later date. I had fun walking the recumbent around and meeting some of the vendors (the recumbent - and the cycling Darth Vader T-shirt I got from Pacific Swim Bike Run - are great ice breakers). 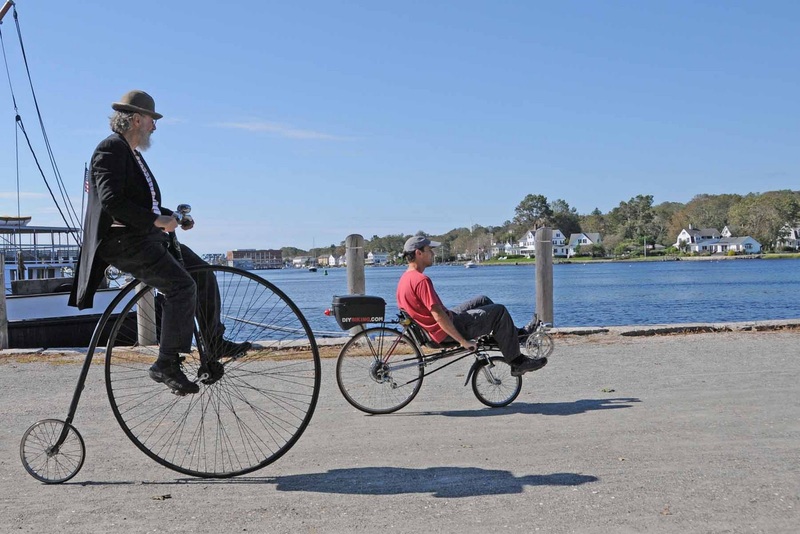 I also noticed that Mystic Seaport employees appeared exempt from the 'don't ride the bike' rule. There were lots of bike to see: bikes that looked old, bikes that looked fast, bikes that looked uncomfortable, and bikes that looked both fast and uncomfortable. Not surprisingly, my parents and my wife were not quite as enthused about the event as I was, so I went to join them at a bench which was facing the Mystic River. The Seaport employee on the Boneshaker (I've seen that bike and another riding around on non-Bicycle by the Sea days) kept riding about fairly gracefully, which made me wonder if I'd ever buy or borrow a replica from Worksman. It was my dad's idea to get me to ride with the Boneshaker guy so he could take a picture with his cannon-sized camera. I wasn't crazy about disobeying the woman behind the ticket counter who told me not to ride or going without my helmet, but it still seemed like a nice idea. I recommend you visit the Mystic Seaport, either just because or during one of the special events. In case you're wondering there is a bike rack right in front of the ticket counter – and I wasn't allowed to ride on the Boneshaker.